CALGARY, Alberta - At 6-foot-5 and 230 pounds, the power that big George Bayer possessed was astonishing. In an era of laminated maple clubs and inconsistent wound balls, Bayer repeatedly smashed his drives over 300 yards. Many feel that if he was playing the game in today's titanium era (he passed away from an aneurysm in March, 2003) he would be out-driving everyone by 40 or 50 yards, just like he was doing in the 50s and 60s. Bayer won three times on the PGA Tour - the 1957 Canadian Open, the 1958 Mayfair Inn Open, and the 1960 St. Petersburg Open -- and finished third in the 1963 PGA Championship. His achievements, in an era when golf was discriminatory to extremely tall or short people, were remarkable. Back then, it was rare to see good golfers with abnormal body shapes and types. 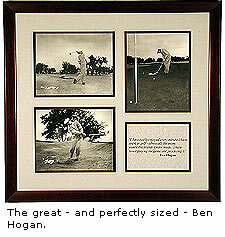 Hogan, at 5'9 and 160 pounds, was said to have the perfect body for golf. Most of the tour players were of average height and build. The game was made for "the average 'Joe.'" Much about what we know in terms of tall and short - and thick and thin people - playing the game has changed. Studies have been done, measurements have been taken, and millions of computer screens have been analyzed. Obviously, tall and short people all over the world are playing the game well. You only need to look at the stats of the Jeff Slumans, the Craig Stadlers, the Ernie Els, the Nick Faldos, to realize that being short or tall, thick or thin, does not need to be a hindrance. How, then, should golf instructors work with people who don't fit the ideal mold? How can exceptionally sized persons get the most out of their game? How should you swing the club if you're 4'9 and 86 pounds? How should you swing the club if you're 6'6 and 270 pounds? The short answer? Let your body type determine your swing. Before we proceed to that, however, it's paramount to realize that abnormal body types generally require abnormal equipment. As instructors, we're trained to work with optimum angles at address. Unquestionably, the angle of the spine is one of the most important aspects of a good set up. This angle is bound to be wrong if clubs do not match the player's size. Poor spine angles lead to poor golf swings. Very tall people who play standard length equipment often develop poor posture (the spine angle is too tilted) and swings that are too flat. Clubs that are lengthened (sometimes up to four inches) and lie angles that are upright are generally desirable. 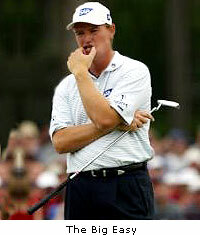 Likewise, many short golfers require clubs that feature flatter than standard lies to mesh with a flatter swing plane. If golf instructors are unable to perform these duties - and it's perfectly fine if they're not - then they should be sending their students to clubfitters who can help. After equipment issues have been dealt with, the next step is to understand the basics of tall vs. short. As mentioned, tall people should have a swing that appears more upright. All too often instructors make the mistake of "fixing" a swing that appears too upright, but in fact, is perfectly "planed" for a taller individual. Likewise, the swing of a shorter person should appear flatter and more rounded. But to fully understand the topic of tall vs. short and how swings vary, inclusion of thick vs. thin should also be considered. Obviously, tall people can be thin (Davis Love lll, young Tiger Woods) and tall people can be thick (George Bayer, Phil Blackmar). Likewise, short people can be thin (Gary Player, Corey Pavin) and short people can be thick (Craig Stadler, Craig Parry). This also will have an influence on how your student will naturally want to swing the club. And, as we have agreed from the start, allowing your student to swing naturally is key. One of the best studies on the topic was done by teaching pro Mike Adams in the late 90s. Adams, in his book titled The LAWS of the Golf Swing: Body-Type Your Swing and Master Your Game carefully examines different body types and explains their tendencies in the swing. Adams describes the swing from the perspective of three distinguishable body-types. The Leverage swing, a flexible, mobile swing for people of medium builds with good strength (Annika Sorenstam, Tom Watson). The Arc" swing, a lengthy swing with plenty of arm action for tall people with long limbs. And lastly, the Width swing, a tight, rotational swing with maximum wrist hinge for people of thicker builds. "The tall golfer can be grateful for the advantage of a large built-in arc, but it comes with penalties attached. Attention to timing and control is imperative for tall players, who often allow their swings to become too long and too loose. The elbows should stay in their address relationship throughout the swing. Ben Hogan tied a belt around his elbows to help keep them together. Elbows-together will help keep a tall player as compact as he can get." "For the small golfer the club is going to be on the target line for a short distance at best. This demands that the slight player be attentive to what Ben Hogan referred to in popular terms as 'pronating', to avoid blocking the shot, Hogan actually was talking of turning the wrists over." "The small golfer has to think of rotating both forearms in a counter clockwise direction in the impact area. If he thinks of turning his wrists over, he's too likely to hit from the top and swing out-to-in through impact." In an era where many golf instructors strive to give their students the perfect "off-the-rack" swing, let this be an encouragement for all of us to allow our tall and small students the obvious benefit of swinging within themselves, taking into full account the frame they've been given. 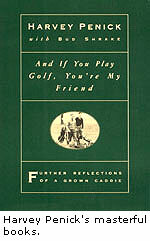 Once again, the words of Harvey Penick sum it all up: "You must fit the swing to the body. You must be yourself." Andrew Penner is a freelance writer and photographer based in Calgary, Alberta. His work has appeared in newspapers and magazines throughout North America and Europe. You can see more of his work at www.andrewpenner.com. Good points all around about the importance of adjusting a golfer's swing to their body type. I'm 6ft7 and 250 lbs. If I tried to swing like Hogan in his )#(&$#(@& book I'd hurt myself.